ya 200 is kinda small. I agree, I would like a bigger mailbox. I have to agree. I spend a lot of time weeding out messages that I'd rather keep. Guess you do have the option to select and download as .txt(or whichever) and same them locally on you machine...........however painful! Last edited by Mazurfer; 03-13-2009 at 08:37 PM. The server will slow down, which was why I was initially refused. Ahh... 0 messages... I didn't realize saving PMs to text was an option. I don't need a larger box then. As Fluid said, vendors may find a larger PM box much more useful. i hate deleting messages that have info that i might need later. has anyone tried CTL+C and CTL+V into wordpad, notepad, etc etc etc? 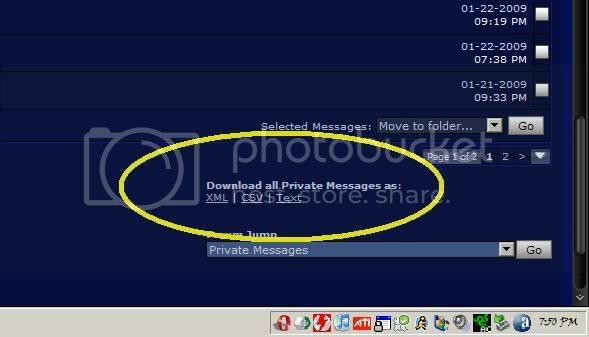 Or if you need access to the info online use the same CTL C and CTL V into a gmail folder? sheesh people. think outside the bun! I just export my PM's as XML files and save them to a folder on my computer that contains anything RX8 related. Not really a big deal. Save to comp, then delete the last 50 messages from my Inbox and Outbox. Vendor's could use a bigger pad though. Half the time people PM MM his inbox is full and you can't get through. Last edited by GaMEChld; 03-18-2009 at 06:59 PM.